It’s important to carefully maintain your hearing aids so they work their best today, tomorrow and for months down the road. Hearing aid maintenance and repair requires daily at-home cleaning, regular servicing at an audiologist’s office, basic troubleshooting skills and occasional professional repairs by a Littleton hearing aid technician. Daily cleanings are the only way to ensure your hearing aids are always working their best. When you get your new hearing aids, your hearing aid technician will teach you how to properly clean your devices. Hearing aid accessories like cleaning tools, cleaning kits, wax guards, wax filters and dehumidifiers are a good way to ensure your devices are getting proper care every day. Along with daily cleanings, some components of your hearing aids—tubing, wax guards, filters and batteries, for example—will need to be changed from time to time. It’s important to keep clean, properly functioning parts handy and keep up with all replacements when parts wear out. Along with at-home care, you will need to see your Littleton hearing aid dispenser for hearing aid servicing every 3–6 months. 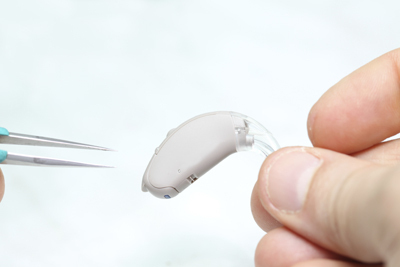 During these appointments, a technician will professionally clean, adjust and check your hearing aids to ensure they’re performing their best. You can also get help with programming adjustments when you visit your audiologist’s office for servicing. If none of these troubleshooting tips work, you may need to visit your audiologist in Littleton for a hearing aid repair appointment. At Columbine Hearing Care, our in-office hearing aid technician Colleen Twomey is a pro at resolving hearing aid problems and is always ready to help. Please give us a call anytime you’re experiencing an issue with your hearing aids.